In recent years we have followed closely New York City’s urban transformation, notably the installation of a growing number of new pedestrian plazas, the redesign of Times Square and Broadway, and the rising focus on pedestrian-friendly streets. 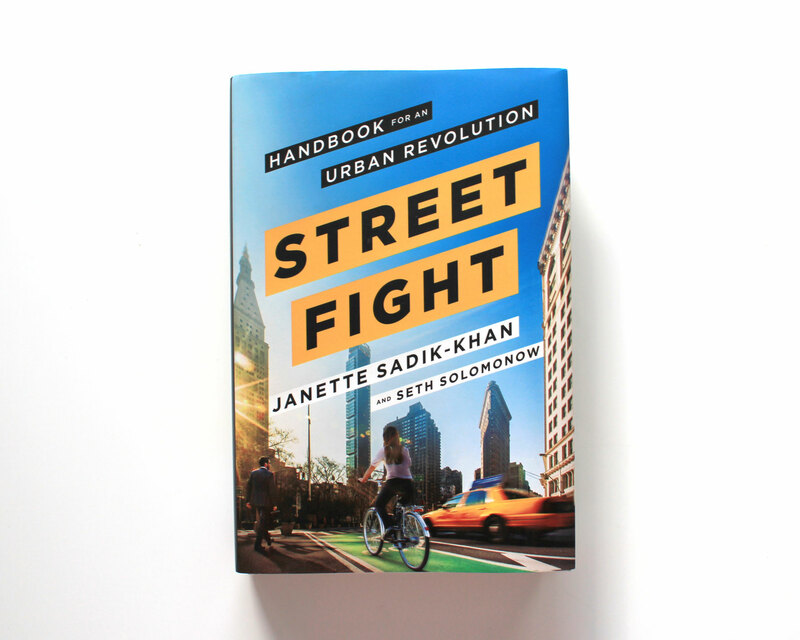 That is why we were excited to get a copy of Janette Sadik-Khan’s recent book – “Streetfight: Handbook for an Urban Revolution“. Subsequently to the drastic urban transformations she initiated as a former transportation commissioner of New York City under Mayor Michael Bloomberg, Janette Sadik-Khan is now a highly influential figure in urban planning. The book sums up the lessons learned during her six years of tenure, to a large extend dedicated to improving street safety, ensuring access to public space for all and pushing relentlessly forward “the most rapid installation of bike lanes ever executed in any city“. The pedestrian and bike-friendly agenda set by Sadik-Khan enabled projects such as Green Light for Midtown and the NYC Plaza Program, both of which extensively discussed in the book, to transform one of the most challenging urban environments on the planet. NYC Plaza Program was launched in 2007 with the goal to ensure that all New Yorkers live within a 10-minute walk of quality open space. Public plazas were installed in place of underused street space encouraging a public-private model of partnership between local communities and the DOT. Often referred to as an example of tactical urbanism, the Plaza Program used temporary materials and movable street furniture to transform refuge island into pedestrian plazas overnight. 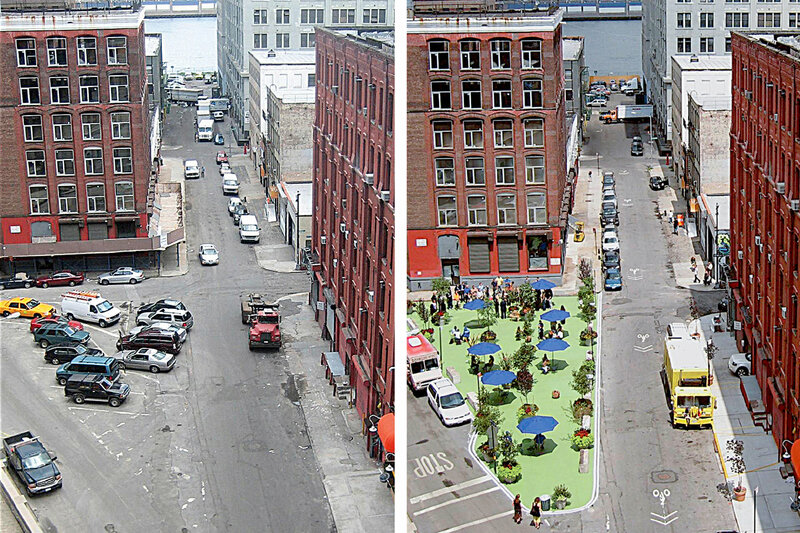 DOT’s first plaza was set up in 2007 at Pearl Street triangle in DUMBO and was followed by another placemaking intervention on Ninth Avenue and 14th Street in Manhattan. 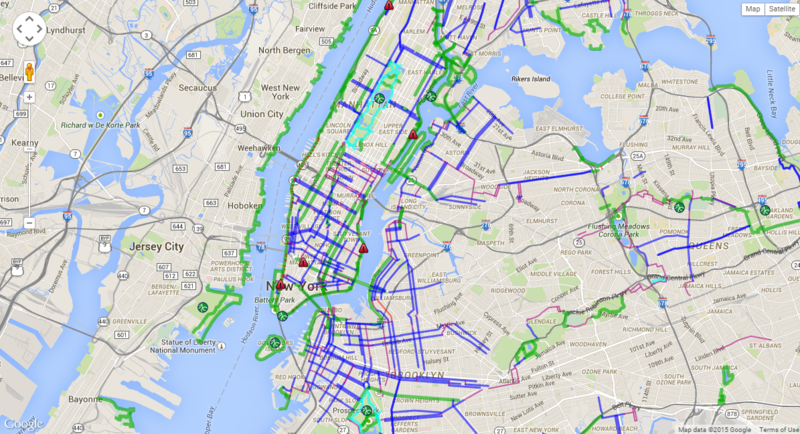 As of today the NYC Plaza Program has led to the installation of over seventy new pedestrian plazas in the city. The successful start of this pilot allowed for the Department to take a step further and initiate what was later known as Green Light for Midtown. In the same spirit of experimentation and with pedestrian safety in mind, the Green Light for Midtown project started with a radical move – by closing diagonal Broadway to cars at Times and Herald Squares. 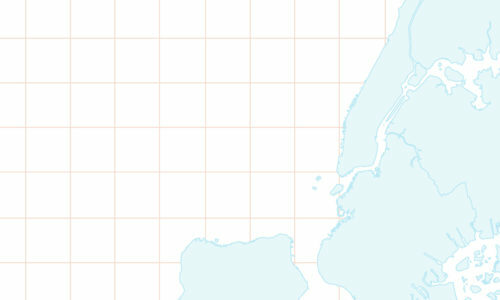 This six month pilot project led to the iconic reconstruction of Times Square by Snøhetta and skyrocketed the area into the top ten retail districts on the planet. The transformation of Times Square started as a temporary closure of Broadway for cars and resulted in a full reconstruction designed by Snøhetta. Janette Sadik-Khan’s tactical interventions were strongly supported by a data-driven approach to urban planning, culminating in DOT’s report – “The Economic Benefits of Sustainable Streets“. 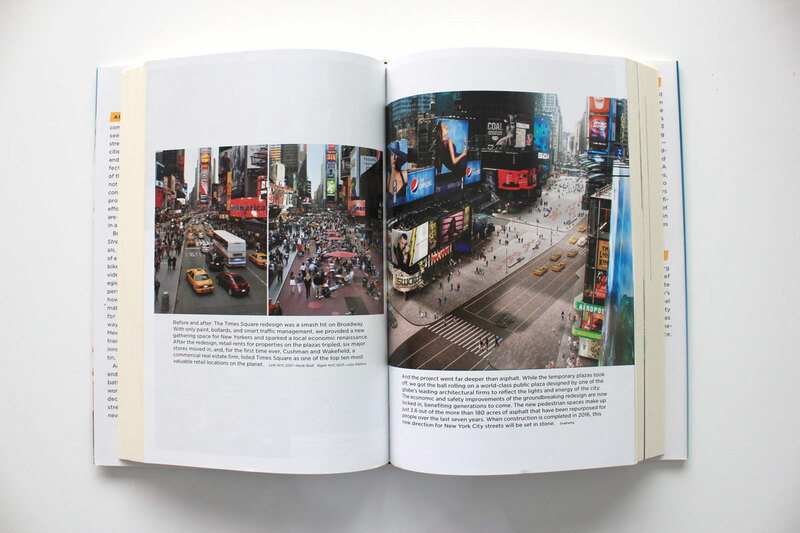 The study, as well as the role of data in the process of understanding the street are discussed in Chapter 12, that emphasizes on the necessity to develop new methodologies for measuring the impact of capital projects. 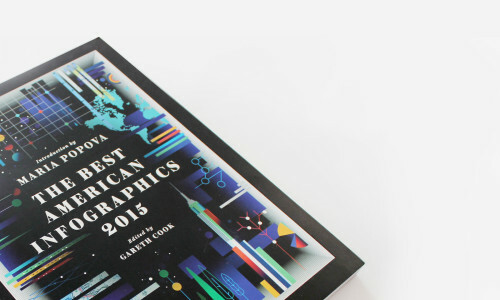 A large part of the book is dedicated to the importance of encouraging multimodal forms of transportation. As a strong supporter of bicycling, former DOT commissioner enabled the installation of 350 miles of cycleways in New York City during her tenure, including the first parking-protected bike lane in North America on Ninth Avenue. The book also tells the story of NYC’s first rapid bus network, inspired by the worldwide success of BRT . The changes initiated by Janette Sadik-Khan and her DOT team were not met without discontent and often led to severe cultural and political backlashes. Nevertheless they show that transforming an urban environment as complex as New York City is possible and set a great example for other cities to follow. “Streetfight” is a must read for anyone interested in transportation and urban planning. Though not necessarily a handbook, this volume illustrates how small, incremental changes can become scalable citywide solutions, when combined with a set of clear goals and the right tools to measure the impact of each intervention.